These are my TAMA Rockstar's in custom Caramel Fade. I utilize a 10", 12", 14", 16" along with a 22" bass drum. A 13ply - 10mm thick 14"x6.5" Starclassic "G" maple snare with PureSound wires round out the drums. I use all REMO Pinstripe / Ebony and Power stroke II / Controlled Sound, batter and resonant side heads other than the batter head on my bass drum which is an Aquarian Super Kick I. All the hardware is also TAMA "RoadPro". I use the TAMA "Iron Cobra" dbl. bass pedal. My cymbals are Sabian XS20 soon to be changed to Sabian AA's. I use AHEAD "5B / ROCK" sticks and a "Roc-N-Soc" throne. 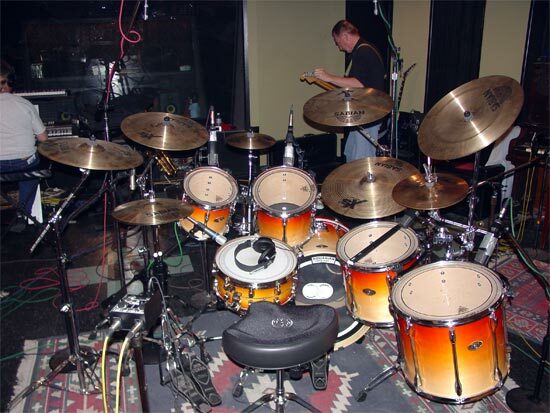 All the drums are stand mounted using the TAMA Starcast mounting system. This picture was taken at the Tempermill Studios in Ferndale Michigan. Some of my influences include Shannon Larkin (Godsmack / AMEN / Ugly Kid Joe / Wrathchild), Stewart Copeland (Police / OysterHead), Travis Barker (Blink 182 / Transplants), Ringo Starr (Beatles / All-Star band) and Kenny Aranoff (John Melloncamp / Studio musician).